Students from the Stan Richards School of Advertising and Public Relations won a total of 62 awards at the 2018 Austin American Advertising Federation (AAF) Student ADDY Awards competition on Feb. 20 at the JW Marriott Austin. 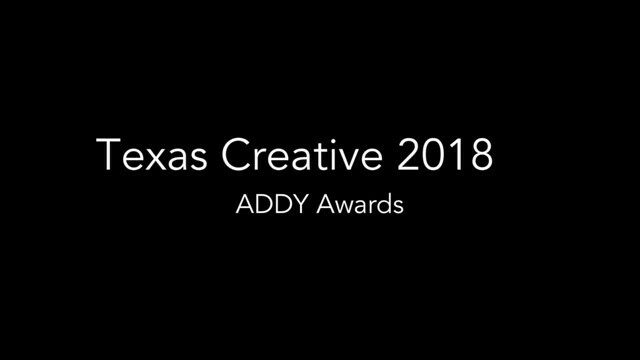 Texas Creative faculty Chad Rea, Sean LaBounty, and Ryan Romero’s students’ won 30 bronze, 16 silver and 16 gold ADDYs for their roles as art directors, copywriters and designers in the fields of advertising, design, and digital works. The most prestigious honor went to junior Sabrina Lau for winning the “Student Best of Show Advertising” award with her clean, simple print ads for Talkspace, an anonymous online mobile therapy and counseling service. When Lau was announced as winner, she was unfortunately in the bathroom. The awards were chosen from more than 30 client campaigns and ads and were categorized as either gold, silver, bronze, judge’s choice or best in show. Nine prominent judges were invited from other top tier markets throughout the U.S. to critique creative submissions from advertising programs located in the central Texas area in addition to grading work from Austin-based professional agencies such as GSD&M, Sanders\Wingo, McGarrah Jessee and djnr interactive, LLC. The local awards will serve as a gateway to regional and national competitions across 231 collegiate chapters, providing more than 8,000 advertising students the opportunity to enter original pieces across the U.S.